Breeding for harlequins can result in a broad array of recognizable color patterns that are combinations of black, white and gray. Many novices, as well as pet owners, are unaware of some of these color patterns. As a result, the color of many danes gets accidentally misrepresented. Also, many pet buyers who like the patched effect inquire only about harlequins, the most expensive of all color patterns in danes, when they might be equally satisfied with one of the alternative patched patterns. We have developed this page to assist both novice breeders and pet buyers in correctly identifying normal color patterns occurring in harlequin litters. We will present several photos of most of the color patterns to show how widely these patterns vary. Some harlequins are beautifully marked while others are far from aesthetic. This is true of each of the color patterns. Beauty is certainly in the eye of the beholder. 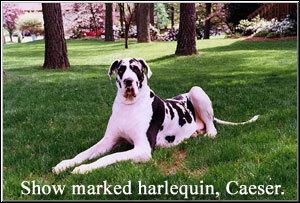 First, we will deal with pure color bred great danes. Since we breed for harlequins, mantles (formerly boston blacks), and merles, this narrative will not address the results of breeding fawns, brindles, blues, or blacks out of black breeding. The great dane colors addressed in this narrative are colors normally seen in litters bred for harlequins, and they are all combinations of black, white and gray. We will briefly show a couple of photos resulting from direct mixed color breeding or doubling on a dog that has mixed color many generations back in the pedigree. When breeding for harlequins, a litter can potentially contain any of the following colors: show marked harlequins, pet marked harlequins (including under marked harlequins), show marked mantles (formerly called boston blacks), pet marked mantles, show marked blacks, pet marked blacks, merles, boston merles, merlequins, piebalds with black markings, piebalds with merle and black markings, whites, and albinos. The only color not illustrated herein is the albino. We are using our own dogs to illustrate color, and we have never produced a true albino. The only two colors that we don�t consider appropriate for general pet homes are the whites and the albinos. Due to both their color and other considerations, they generally are either put down or placed in special homes. This description of the show marked harlequin color is quoted from the AKC standard: �Base color shall be pure white with black torn patches irregularly and well distributed over the entire body; a pure white neck is preferred. The black patches should never be large enough to give the appearance of a blanket, nor so small as to give a stippled or dappled effect. Eligible, but less desirable, are a few small gray patches, or a white base with single black hairs showing through, which tend to give a salt and pepper or dirty effect. Any variance in color or markings described above shall be faulted to the extent of the deviation.� I have seen numerous pet marked harlequin champions over the years, but generally speaking, the more the dog deviates from the color standard, the better it has to be in other respects to finish. Read the article written by "Maxim's Dogue Brasil" on Piebalds. Pet marked harlequins have a white base color with torn black patches. They may have excessive �ticking� (black hairs in the white base color) to the point that they almost look gray. They may have many large gray patches. Their black patches may be so large that they are, in fact, blankets. They may have a beautiful harlequin head with a solid white or nearly solid white body. Click here to continue the color pages.